Are you looking to save on gas or reduce your carbon footprint? If so, you might want to consider purchasing a moped. They’re excellent for traveling to the grocery store, work, the gym, and for performing any other type of errand. They’re easy to operate and, with the option to purchase an electric- or gas-powered moped, these vehicles emit little to no fossil fuel. Although their trunk space is lacking, mopeds are perfect for getting where you need to be. If you are to operate a moped legally, you must be at least 14 years old. 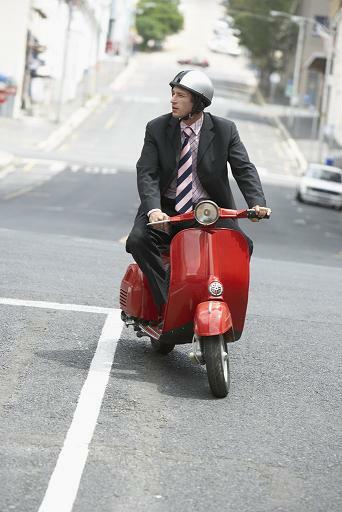 Individuals who violate moped laws are guilty of a misdemeanor and must be fined a minimum of $25. South Carolina law states that the State has the right to suspend, revoke, or cancel a moped driver’s license if he or she has violated a moped law while operating the moped. Any person looking to receive a moped license must perform an eyesight test, an exam that tests the applicant’s ability to understand road signs, as well as an exam to analyze the applicant’s understanding of traffic laws. Moped licenses do not require a picture of the moped operator. Moped drivers can only operate their mopeds on public roads and highways and are prohibited from driving on interstates. To learn more about South Carolina moped laws, visit the SC Department of Motor Vehicles website. Share this post with your friends on Facebook. If you have been following our law firm blog, you will recall the recent post dedicated to New Years Resolutions and the resolution Cristin and I shared to get our concealed weapons permit. Last Thursday we took a step forward in reaching our goal and attended Ladies Night at the ATP Gun Range in Summerville. After sitting in traffic on I-26 for a grueling hour, we finally arrived at ATP. Wow! We had no idea how huge the building would be–it is practically a Costco-sized space featuring two indoor ranges and a store filled with every type of gun and gun accessory you could imagine (even pink guns!). The first part of Ladies Night is spent in the classroom. Pat, our instructor, gave a lecture on gun safety and the basics of shooting. It was great to have a teacher that spoke in simple, understandable terms, and used analogies that non-gun-savvy individuals would understand. One of the highlights of the evening was at the end of his lecture. Pat gave us a choice of 3 different ATP Ladies Night T-Shirts to choose from. Both Cristin and I chose the shirt shown below, and plan to wear it on days we need to exude a tough, no-nonsense persona! The remainder of Ladies Night was spent on the range where we each had our own instructor. Our pink hearing protection, provided by ATP, was the perfect touch to our shooting attire. 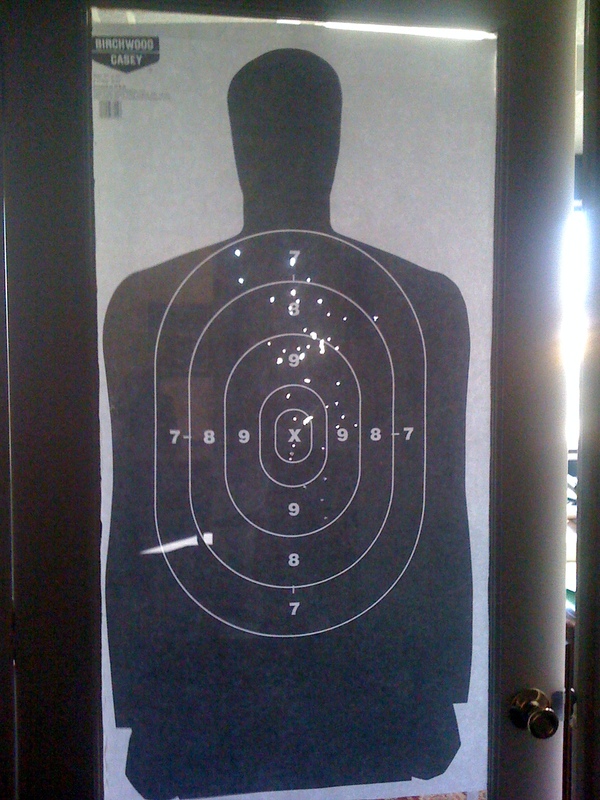 Next we were able to choose whether we wanted to shoot a revolver or a .22 pistol. Both Cristin and I chose the .22. Fifty rounds later, and many helpful tips in between, the class came to an end. Not only did we leave with our targets, but most importantly with a greater confidence in shooting. We will definitely return to ATP again soon and highly recommend their Ladies Night Course to any lady interested in shooting. Just when we thought the night couldn’t get any better, while sitting at a red light we see our Uricchio Law Firm bumper sticker on the truck in front of us! 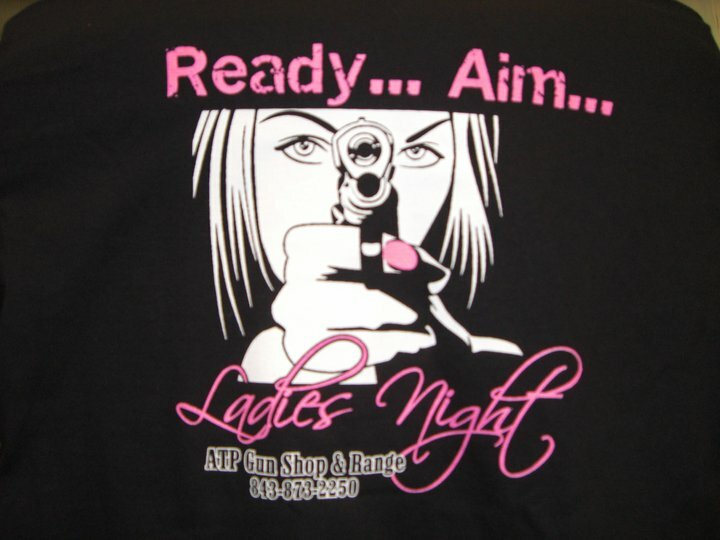 For more information about ATP Gun Range and their Ladies Night course, visit their website, and facebook page.